February 2019 – From 1 to 3 February 2019 the 4th edition of the Salon de la Gastronomie des Outre-Mer et de la Francophonie (French Overseas Gastronomy and Francophonie Fair) was held in Paris. Babette de Rozières, the fair’s founder and cuisine chef organised the Trophée Babette, a competition dedicated to highlight culinary students through the creation of a dish representative of Overseas French gastronomy. 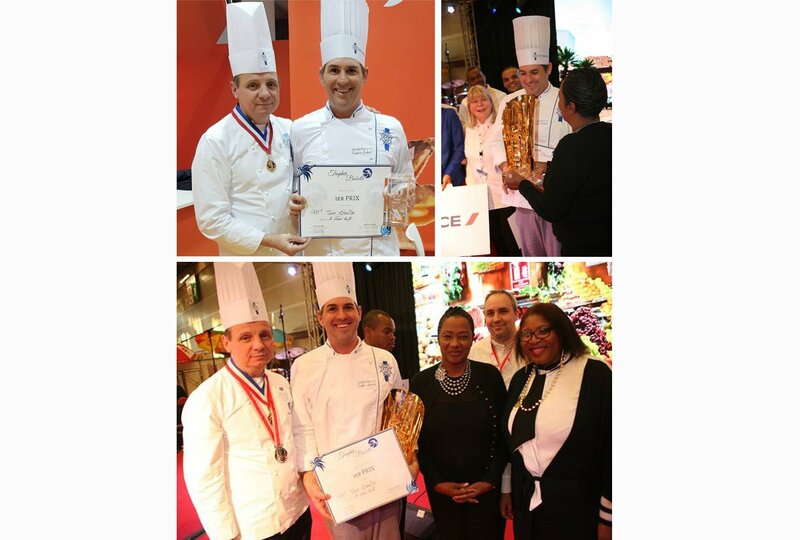 Le Cordon Bleu Paris was represented in this competition by 3 Cuisine Diploma students: Yen Valavalkar (India), Park Miyang (USA) and Todd Spaits (USA). After three days of competition, and three different dishes created, Todd Spaits was announced as this year’s winner. We met him to learn more about this first accomplishment in his new chef life. My name is Todd, I am 44 years old and I’m from the US. I have worked in the tech industry for the last 16 years, and still own my tech company. After working in IT for years, I felt like I wanted to finally study at Le Cordon Bleu, it was my dream since I was a kid. I already worked in the restaurant industry as a waiter and a bartender, but never as a professional cook. Chef Briffard called out for candidates and I accepted because I think being involved in whatever I can is the best way to learn, and it sounded fun. What was this competition like? The competition lasted three days, and we had to make a different plate every day. We were 12 on the first day, the jury then picked 6 candidates for the second trial, and we were 4 during the finale. We had a basket with different products and had to come up with a recipe. As it was Overseas France food, we had products from Tahiti, Guadeloupe, Martinique, Reunion Island… The recipes thus had to be spicy as you would find it in these regions. I have travelled a lot and have always been cooking, so I was already familiar with these products. We only had 45 minutes to cook and present the dishes, which is a really short time. How did you feel during the competition? I felt ok the first day, and the second day was my best day, I felt really good because I liked the ingredients and I had a good plan for it, so I really knew what I was going to make. I did ceviche, with coconut milk, onions, chillies, so it was easier as I did not have to cook. The third day was the most difficult as it was rabbit, and we do not eat a lot of rabbit in the US. I was standing there in front of a hundred people and did not have a plan, I had no idea of what I was going to cook! I then came up with something, but at the end I did not think I won. Another candidate from the Reunion Island was very technical, he knew what he was doing. I think the reason I won was because my recipe was really spicy, with a lot of garlic. What is it like to win a cuisine competition? Competitions are fun, and you really learn. During practical classes at Le Cordon Bleu, you have to make a dish in 3 hours and all the ingredients are provided to make the perfect recipe. Whereas during this competition, I only had a very limited time to make a recipe out of a selection of ingredients. In both cases, the Chefs or jury look for the balance between presentation, taste and technique. I was very happy that the way I chose to do things worked out and pleased the jury!